Phidias was a Greek sculptor of the 5th century BC that is basically known for having built one of the wonders of the World, the statue of Zeus. His biography leaves a lot to the shadows because we do not have enough archaeological materials to reconstitute it fully. There are, however, several sources which allow us to approach the truth, its sources being the narrative of persons who, in documents written later, (Pliny the Elder, Cicero, Strabo, Plutarch) some important events of its existence. Phidias son of Charmides was born about 490 BC in Athens. He goes to an artistic profession and finds himself trained, young, by Ageladas, a master who has worked several times for the decoration of the sanctuary of Olympia. He also spent time at the Argos school where he learned how to use bronze. At 20 years old he already has a great mastery of his art. In 460 BC he obtained his first commission, the realization of a gigantic statue (8m high) of Athena. It was made of wood covered with gold with marble hands and feet. This statue was an order of the city of Plataea. Between 464 and 450 BC, he made two bronze statues which were placed on the Acropolis, a 9m high statue called The Athena Promachos (438 BC), of which, Pausanias says, "the navigators on Cape Sounion could distinguish the point of the spear and the egret of the helmet, "and the Athena Lemnia. At the age of 43 (447 BC) Pericles confided to him the decoration of the Parthenon, the pediments and the execution of the chryselphantine statue of the naos of Athena Parthenos, which measured 11.5 m high. Phidias worked at this statue from 447 to 438, nearly nine years. It is this technique of assembling gold leaves and ivory pieces to make colossal statues that will make Phidias a sculptor admired by all. Alas for his friendship with Pericles, he was accused in 433 of having diverted some of the gold and ivory destined for the statue. He is condemned and flees to Olympia where he is proposed the construction of the chryséléphantine statue of Zeus, a site he accepts. It is important at this stage in its history to indicate that the chronological order between the realization of the statue of Athena and that of Zeus is not fixed, the specialists contradicting sometimes. As a result, Phidias did not know exactly how long Phidias worked at Olympia. A serious hypothesis indicates that Phidias would never have fled from Athens, but would have been consecrated at the inauguration of the Parthenon, which enabled him to obtain various proposals, including those of the Eleans at Olympia. Another element is that Phidias would have made the statue after that of Athena: On the statue of Zeus there is a personage who is, according to Pausanias, Pantarkes. Pantarkes won the wrestling contest during the 86th Olympiad "(436 BC). Finally to finish with Phidias it is necessary to know that its workshop was discovered, archaeologically speaking, on the site of Olympia. Objects have been found but do not yet specify the dates on which they were used. This painting was originally commissioned for a ceiling of the Charles X Museum (1827). This painting was initially commissioned for a ceiling of the Charles X Museum It shows Homer deified surrounded by artists of Greek antiquity. When he began to develop his artistic tastes, Phidias turned his attention to realism, a complex work in that he demanded enormous precision in the representation of human bodies, but also in the expression of feelings as well as in the representation of movement . The work done on the bas-reliefs is remarkable by the use of techniques unusual at the time: It breaks the linearity of the frieze by the use of characters against the current and works intersecting curves instead of regular lines. The characters of the friezes are also perfectly detached and staggered, which gives an impression of order and therefore of crowd. His work is very precise. The site of Olympia is rich in archaeological remains, but unfortunately the statue of Zeus having been moved before disappearing one can hardly expect to find information on what it was there. 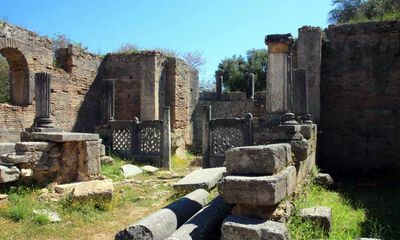 However, in 1958 the excavations undertaken outside the sanctuary allowed the updating of the workshop of Phidias. There are characteristic carving tools. This site, of which pictures are given below, is to the west of the temple. It also contained remnants of glass-making activity, as well as remnants of gold, ivory, semi-precision stones, bronze, ebony and amber pieces, plaster, and a statue on which one reads his belonging to Phidias. 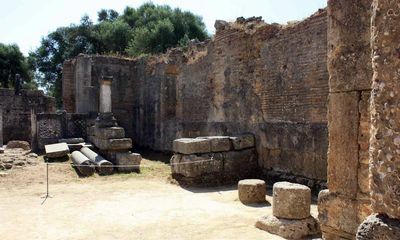 The archaeologists made a comparison of the dimensions of the workshop and the naos of the temple (the sanctuary), and since it is of the same size they can conclude that, hypothetically but probably, the statue was made piecemeal in the workshop , each piece being transported in the sanctuary as the work progresses.